A lot of very impressive technology has gone into the new Active Office at Swansea University’s Bay Campus. As the UK’s first energy positive office, its design combines a variety of the most innovative solar technology on the market today to generate more energy than it uses. It’s also unusual in that very little of it was actually built on the campus; instead it was built using offsite, modular construction. No doubt you’ll have seen a lot about offsite construction in the media recently. It’s being hailed as an answer to the broad problem of skill shortages within the construction industry, and the housing shortage the UK is currently experiencing. A construction site is very rarely the easiest place to do anything. Operatives on site might be working in a variety of conditions day to day, and not all of them conducive to high quality working. That’s not to say it’s impossible to deliver high quality work on site, it’s just harder. The answer to this is doing as much construction as you can in controlled conditions that facilitate better working practises. This can take a number of forms, depending on what is delivered to site. Sometimes only elements of the building are done offsite, for example M&E services (mechanical & electrical) or bathroom pods, up to modular construction. 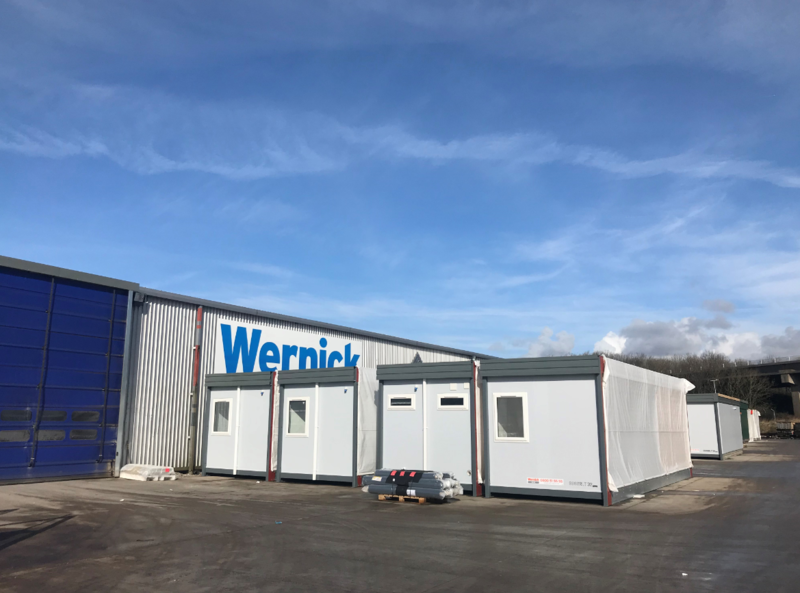 Modular is the method where the most is done offsite; where the building is designed in modules that can be factory built and transported to site via lorry. Once there, they are craned into position, bolted together and, if needed, connected to mains services. The amount of internal and external finishing needed depends on the complexity of the project. The benefits of offsite are abundant, and the closer you look the more advantages over traditional construction you can find. A big advantage is that the effect of weather on the construction process is negligible. Not only does this speed up construction, but also makes the program, and therefore cost, more reliable. We can also undertake different parts of the program concurrently; while foundations are being prepared on site, we can be manufacturing the building in the factory, even building multiple storeys at once. It isn’t just the buildings are built faster, but a higher quality is more easily achieved, and more repeatable. A consistent work environment facilitates a consistent product, so we know that our system will have the same energy performance no matter if it’s delivered down the road in Swansea or taken to the farthest reaches of the Scottish Highlands, as some of our buildings have been. Factory manufacture also limits waste, whether that’s energy or materials. All of our waste is segregated for recycling, with virtually nothing going to landfill. Our product design is actually informed by the size of materials as they’re supplied, to minimise waste before manufacture even begins. These are just a few examples of how offsite improves on traditional methods. Obviously, not everything can be manufactured offsite – but using this technique wherever you can will provide clear benefits.